Remain confident when it comes to your personal safety with the fun and colourful Double Oven Glove from the Lintu Dandelion and Pebble range. 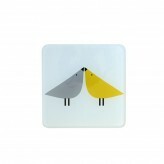 Bright and cheerful in colour, add some charm to your kitchen with this bird print double oven glove. Along with being stylish, this double oven glove conforms to the current EN407 and BS 6526:1998 safety standards. A steam and grease proof barrier has been included for maximum heat protection, while this double oven glove also carries the CE mark. Measuring at 89 x 19cm, when it comes to caring for your double oven glove, we recommend machine washing at 40°C with similar colours. 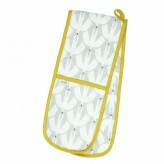 Partner this Lintu double oven glove with the matching apron and tea towel, or mix and match with the adorable Mr Fox range. 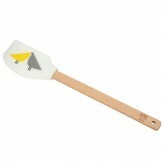 Trendy and practical, remain safe when cooking with Lintu.